Throughout his career, Ed Eppley has been able to assemble a deeply-skilled group of alliances with experts in key industry and business discipline areas such as behavior and personality assessments, coaching experts, merger and acquisition, private equity, legal, ESOP, and capital allocation, among others. We’ve counseled and trained small business owners, Fortune 200 CEOs, and midlevel managers in vast hierarchies all over the world. Every person in a leadership position we’ve ever met had room to become a better one. When the market and you demand that your people deliver more, faster and better than last year, with no additional resources, then developing your people is your only answer. There is an ability and diplomacy needed to make complex challenges simple and allows progress to be made. We guide the discussion and conversation that needs to occur among you and your team, we don’t lead it. We listen, ask questions, and sometimes let you hash it out. Having our unbiased influence helps you take control of the reigns and set the direction of your organization. We make sure you achieve the intent of your meeting, however critical it is – strategic planning, discussions between owners, executive teams, vendors and suppliers – all focused on getting to an outcome everyone agrees on. After taking you and your team through a training or workshop, or meeting facilitation, we determine the necessary actions needed over the next 90-120 days. We then reconvene to assess progress and determine if ongoing counsel is needed to ensure accountability among those involved. Monthly, quarterly, or annually, our approach keeps the momentum and process moving in the right direction. Contact Us for more information on a customized training, workshop, meeting facilitation, or ways we can help you and your organization. 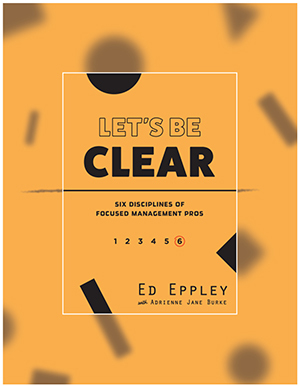 A new book by Ed Eppley, with Adrienne Jane Burke, covers six disciplines critical for today’s professional manager. Are you ready to take your leadership to the next level? Take this free assessment and find out how you measure up. We’ll then show you where you can focus on improving your skills.